View of “We Are the Primitives of a New Era,” 2013. Though the subject has remained consistent, the mediums have varied. 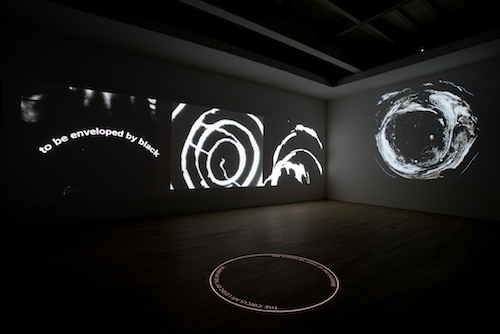 They include paint on paper, sometimes textured with sand and resonant with the current vogue for tactile monochromes of sensual delight; hazy photos of irregular forms, christened “videograms,” developed by exposing photographic paper to television screens; and projection environments utilizing his staccato experimental films and abstract “lumagrams,” or handpainted slides. (Having cofounded a space for “Electromedia” in New York in 1967, Tambellini is only now being awarded his rightful place in the histories of video art and expanded cinema.) A common thread throughout his oeuvre is the détournement of communication channels, whether turning television into abstract art by pointing lights directly into a video camera (Black Video I, 1966/2013) or inverting and painting over architectural paper (E-7, from the “Black Energy Suspended Series,” 1989). Even the blackness of his works—which here thematizes opacity and can lead us to privilege our other senses—signals the artist’s refusal to submit to the colorful visual economy of everyday life. This is a stance that is simultaneously old-fashioned and fresh, and unexpectedly removed from the spectacles generated by some new media artists following in his wake today.